Plants and Animals work in conjunction with each other to sustain life and one without the other would simply just not exist. Gardening is the essential building block of all life, whether it’s purposely done by humans or naturally by the earth. Plants create oxygen which is necessary for us to breathe and we output carbon dioxide which is like their oxygen. To no surprise we need each other to survive. Including plants in your household will not only add a decorative decor but output fresh clean oxygen for you to breathe as well. The more plants the better. Plants give off good energy and vibrations which will add to a positive lifestyle nonetheless. 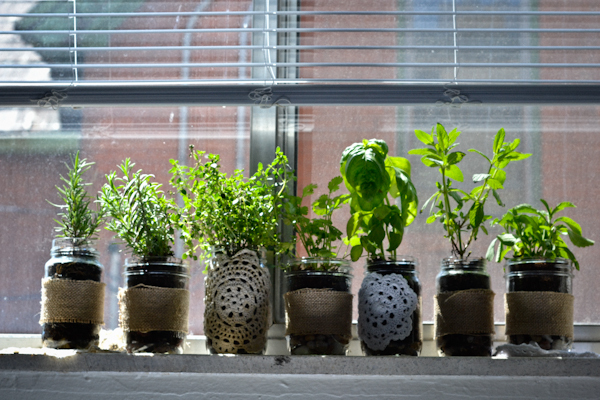 There are many small plants and herbs that you spread throughout your household. Doing so you are now adding fresh ingredients to cook with and eat right at your fingertips. 1. Invest in some mason jars. Since they’ve recently expanded in popularity you can find them in pretty much any grocery or hardware store. You can even use recycled pasta or pickle jars with the labels soaked and the jars thoroughly washed to save some money. 2. Do not start your mason jar herbs from seedlings. Use transplants instead. These will have roots that are a little larger and will be sturdier and grow faster. 3. Drainage. To make sure your herbs receive appropriate drainage drill a few holes in the mason jar. This step can be dangerous, so be sure to wear safety glasses and gloves. Use a diamond cutting drill bit and cover the jar with cutting oil. Use even pressure and drill slowly to prevent breakage. Make several 1/8 to ¼ inch holes in the Mason jar. If you don’t like the idea of using a drill you can fill the bottom of the jar with an inch or so of stones or marbles. 4. Fill the jar with a bagged potting mix or your own mix of equal part sphagnum peat, compost and sand to about 1 inch below the jar’s edge. Fertilizer can be added into the soil medium at this point or use a soluble fertilizer after planting. 5. Plant the transplanted herbs so the root ball is level or slightly below the surface of the potting medium. Moisten the potting media first with a bit of warm water, then add the mix, covering the tallest transplant root ball so it sits with its top surface ¾ inch below the rim of the jar. Water the Mason jar herb garden thoroughly. 6. Place your makeshift garden in a sunny area where they get at least six hours of sun per day. Keep the jar of herbs moist but not sodden. 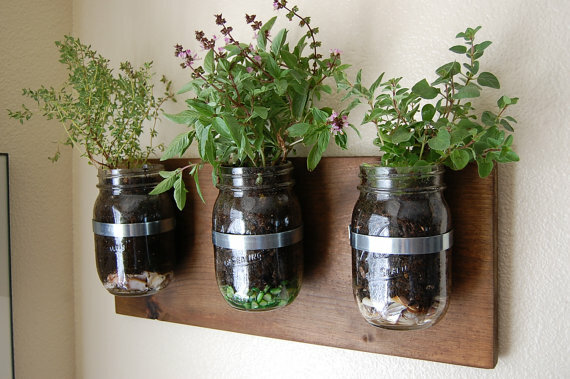 As the plants outgrow the jars, replace them with new transplants and move the bigger herbs into larger pots.